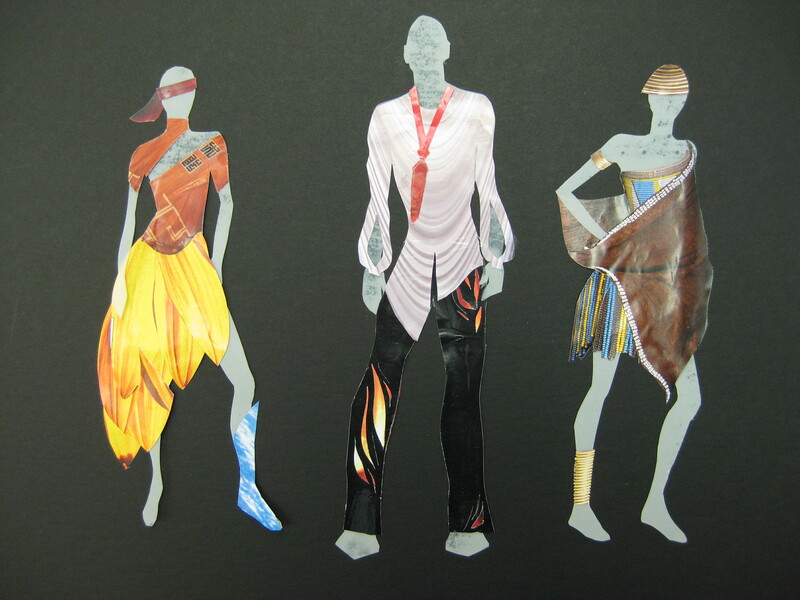 Our Fashion Design unit is part of the Design I class. It is approximately 3 weeks in length and covers the history of fashion design, ethical and moral issues related to fashion, the impact of social issues on fashion design throughout time, sustainable design, the principles and elements of design and an annual fashion show from recycled clothing. Projects have included figure drawing, fashion illustration, drawing flats, designing nature inspired clothes, culture fashion boards, and an all-school clothing drive for an area homeless shelter. For our recycled clothing project and runway show as seen on the WZZM News, I have been able to get huge bags of clothes for free from church clothing sales. This year, I missed the sale, so I ended up going to the local Goodwill distribution center and buying at 49 cents a pound. I try to find vintage clothing, clothing with textures, and also non-clothing items, like window curtains, doilies, bed shams etc. It is always fun to score some accessory items too like vintage jewelry, shoes, hats, belts. I allow my students to bring in their own clothing, but it must be pre-worn, not new. It also can not be simply a roll of material. My mothers who sew do not need the pressure of making a whole new outfit, and it takes away from the creative energy of using recycled materials. Basically, we have had some preparation with fashion history, principles and elements of designing, we have had some fashion drawing and some design work before this project. (Usually just two weeks worth). I throw the clothes in a huge pile and then pass out numbers. Student get first dibs according to their numbers. They can always trade in/out if they end up not wanting their choices, which happens often. I have found this creates instant ideas, as they have to think more instinctively rather than pondering too much right away. Students design for two days with drawings and maybe some cutting and pinning (if they know what they are doing). Then I have three moms or grandmothers volunteer for 3 days. It is a whirlwind for all of us (here is a video of the designers at work), but super fun. Most volunteers stay an extra class period to finish up a project. It is great to see inter-generational work going on, the students and volunteers are both very excited to see their designs come to life. Students choose to be their own model or ask a fellow student to model for them. I love seeing the choices of models. Although some students pick the kids who are the biggest “hams” in school, others pick quieter, more poised students. We get a variety of grades and sizes because students are typically working from a “pre-size” pants or top (though, many have the size altered to fit their model). One year we had a little, tiny 7th grader walk down the “runway” with the whole entire student body cheering her on. Awesome stuff! We also use this time to talk to the whole student body about sustainable design, clothing and our annual school clothing drive. Administration has been gracious to let us do the twelve minute fashion show at the end of the school day, and teachers let participating students out early to get prepared. 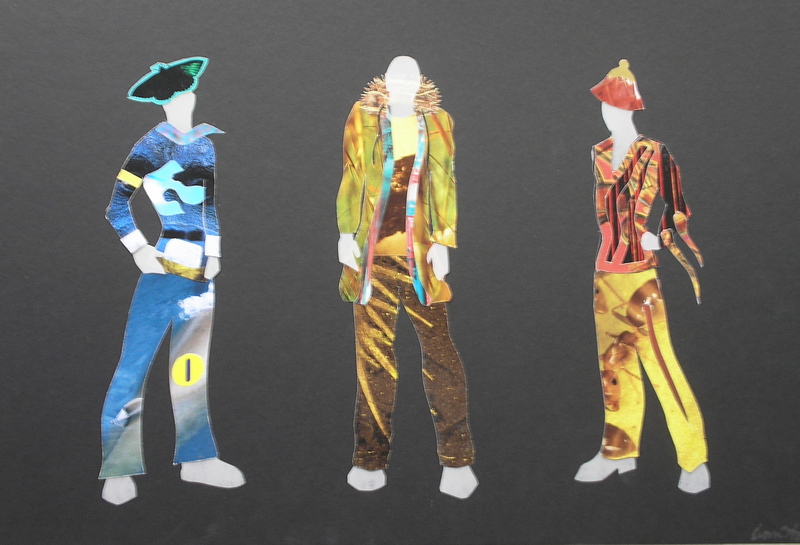 This is a very successful preliminary project to the fashion design. There is quite a bit of leeway for the connection of water, earth, wind, fire. Students just need to emulate 3 of the 4 natural elements. Using magazine photos students search for a variety of textures and patterns that are not a part of an actual clothing design already. Then they consider the natural line of the pattern or texture or even object, and cut along that. We discuss how high fashion for runway shows might go to this extreme with using the shape of a crab for a hat for example. I emphasize layering materials and using the principles and elements of design. Students study a culture of choice, or even a historic artwork or famous architecture and use it as a springboard for a new fashion design. I encourage students to push beyond what already has been designed in that culture’s fashions. To use it only as inspiration for a new design- maybe the patterns of the culture, the housing, the crafts, the landscape etc. After rendering their design they create a fashion board with materials and photographs from that inspiration which are mounted onto black photo board. Ideally, we take the time to do gesture drawings, and fashion illustration so that their clothing designs are not on a “template” but sometimes we run out of unit time to do this.